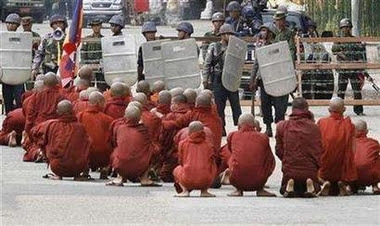 The silent battle of the Buddhist monks against the Myanmar dictatorship continues. Following September’s violent repression of peaceful street protests led by the Bonzi, it would seem that the non violent movement against the regime has been silenced. The monk’s refusal to accept the traditional military offering, the first sign of their dissent of the junta’s policies, has been constant, even over these past few weeks. And today “it will be brought again to bear” inhabitants and activists in Mandalay. Today Myanmar celebrates the annual day of “rice giving (Tha Din Gjut), which marks the end of the Buddhist month of fasting. The faithful traditionally gift religious with new robes, umbrellas, food and other useful objects. Each gift bears the name of the donor and they are gathered in public. But this year no-one will accept the gifts which arrive from members of the military. A few days ago a notice issued by monastery leaders warned that “whoever accepts gifts extended by the military will no longer be recognised”, in short a Buddhist form of excommunication. Many Bonzi have already refused to visit the State ceremonies. The military concerned that this move will rekindle discontent, have attempted to exploit the event to support their internal propaganda. For the past two days at least they have been recruiting Buddhist monks to participate in their State ceremonies, who will publicly accept military gifts. On October 14th in –local residents tell –official alms giving ceremony was held with the participation of over 400 monks, widely carried by local media. But the people are convinced that the army forced the religious to participate or that they might have even staged it for their own ends. “Very little is needed – the say – to transform a simple citizen into a monk: all you have to do is shave his head and dress him up in red robes”. Their aim is to convince the nation that the Bonzi are behind the government and that those who took to the streets in protest where a minority of hot headed youths. The Burmese Minister for Religions words attest this theory. Thura Myint Maunt, yesterday held a rare speech before a group of Bonzi carried by the government daily The New Light of Myanmar. It reports that the minister asked the monks to “understand” the reasoning behind last month’s violent repression. Myint Maunt explained that authorities had to act against “false monks who incited the crowds” urged on by “American president George W. Bush”. He then apologised if some innocent monks were caught up in ensuing arrests. According to official data, the violence used to quash the peaceful protests in September left 10 people and 3 thousand people arrested most of who have since been freed. Instead diplomatic sources and Human Rights activists say the victims were in the hundreds, 6 thousand people arrested and they also speak of a crematorium situated just outside Yangon into which the authorities threw the bodies of those killed during the protests along with the injured in order to hide the real toll of the repression’s victims.